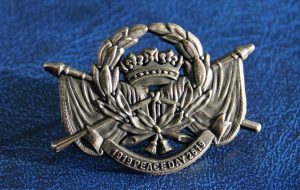 Home / Posts Tagged "Peace Badge"
Following the Great War Armistice signed on 11th November 1918 various peace treaties were signed during 1919. These culminated in a series of ‘Peace Rally’s’ throughout the United Kingdom of Great Britain and Ireland during August 1919. History Hub Ulster are offering for sale a ‘1919 – 2019 Peace Day’ commemorative lapel badge. Designed for History Hub Ulster by John McCormick, antique brass finish, measuring 35mm x 25mm with 2 pins & clasps on reverse. Cost is as follows. Postage will be by 1st class. or by sending a cheque f/o History Hub Ulster to 12 North Circular Road, Lisburn, BT28 3AH with number required and postal address.